The Long-term Care Insurance System was launched in 2000 as a system for society as a whole to support the long-term care of the elderly. 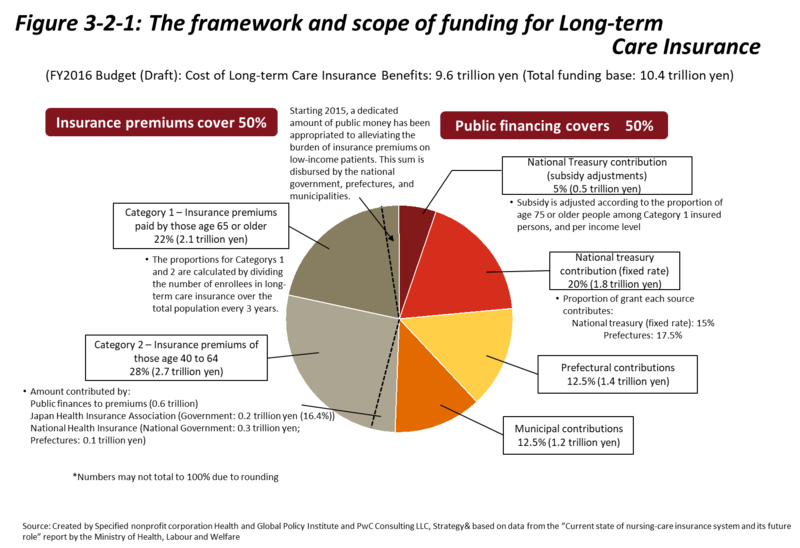 Municipalities operate as insurers, and all citizens over the age of 40 are covered by this system. In comparison to other countries, this system is quite generous in terms of the levels of coverage and benefits. More than 5 million people were eligible for Long-term Care Insurance as of April 2016. The foundations of Japan’s Long-term Care Insurance are described in detail in Section 1. Under the Elderly Welfare System that existed in the past, municipal governments were given the final say in the selection of services, and since users could not select services, the content of services tended to be uniform. In addition, since service fees were based on a patient’s ability to pay, people with middle- and high-level incomes shouldered heavy burdens, and general hospitals began to face problems related to long-term hospitalizations for long-term care. Along with the rapid aging of the population, the number of people requiring long-term care as well as the length of care itself increased, and long-term care needs grew greater and greater. At the same time, the status quo in which families traditionally met the needs of the elderly began changing, with shifts toward nuclear families and the aging of the generation that provided care. After taking into account issues and changes such as these, Japan developed the Long-term Care Insurance System as a way for society as a whole to support the long-term care of the elderly. ○ Independence support: To go beyond simply providing necessary long-term care and also support the independence of elderly people. ○ User-oriented system: To provide users integrated access to health and welfare services from diverse entities at the their own discretion. ○ Social insurance system: To employ a social insurance scheme with a clear relationship between benefits and burdens. Enrollees in Long-term Care Insurance are divided into two categories—Those aged 65 and over (Category 1 Insured) and those ages 45 to 64 who are concurrently enrolled in other medical insurance schemes (Category 2 Insured). ○ Category 1 Insured: Eligible for services regardless of whether they receive Certification for Long-term Care Need or Certification for Support Need. ○ Category 2 Insured: Eligible for services only after they receive Certification for Long-term Care Need or Certification for Support Need due to aging-related diseases (specified diseases). Category 1 enrollees (age 65 and over) pay their health insurance and Long-term Care Insurance premiums separately. Premiums and insurance rates are set by municipalities and pegged to nine standardized levels of income. For Category 2 enrollees (ages 40 to 64), health insurance and long-term care insurance premiums are paid together in a lump sum. ＜Column＞Why age 40 and over? As show in figure 3-2-1, half of the financing for Long-term Care Insurance comes from enrollee premiums, while the other half comes from public funding. The budget for long-term care benefit pay-outs was set at 9.6 trillion yen in FY2016. Funds were sourced from Category 1 premiums (2.1 trillion yen), Category 2 premiums (2.7 trillion yen), the national treasury (2.2 trillion yen), prefectures (1.4 trillion yen), and municipalities (1.2 trillion yen). Similar to medical expenses, long-term care expenses are increasing annually along with increasing benefit costs, and this trend is expected to continue in the future given the ageing of society in Japan. Imbalances in funding and financial burdens exist among prefectures as a result of the fact that prefectures with high proportions of people over age 75 face rising benefit pay-outs, and prefectures with low average income levels face falling revenues. Financial actions are being taken, with five percent out of the 26% share of funding provided by the National Treasury subject to fiscal adjustments. The system of adjustments bears close resemblance to initiatives within the Medical Care System for the Elderly (explained in Section 1.2) in the sense that both systems are designed to help reduce imbalances among the fiscal resources of different insurers. To use long-term care services, applications are submitted to municipal government offices or Comprehensive Community Support Centers. To qualify, applicants must receive Certification of Long-term Care Need or Certification of Needed Support. Upon receipt of certification, care managers prepare plans for applicants, enabling them to use a variety of services. A person’s level of required care (classified as Preventative Support Level 1 or 2, or Long-term Care Level 1 through 5) is determined by a committee of specialists that takes into consideration a written diagnosis from an attending physician and an on-site survey that addresses 74 items related to the activities of the person’s daily life. The appropriateness of the person’s level of care is then re-evaluated every two years or following marked deterioration in health. 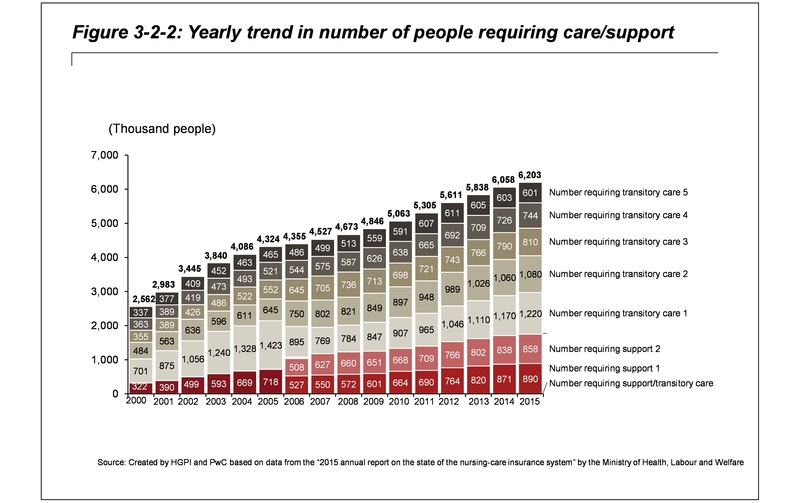 The yearly trend in the number of people requiring care is shown in figure 3-2-2. To address the fact that demand for long-term care does not decrease and to curb the continual growth in the population requiring light degrees of care (Preventative Support Level 1 / Long-term Care Level 1), the 2006 revision of the Long-term Care Insurance Act introduced preventive care services. At that point, recipients previously certified to receive Care Level 1 were split into Long-term Care Level 1 or Preventative Support Level 2 depending on whether their condition seemed likely to improve or remain the same.